In Joshua 10:1-15, we read that five Amorite kings and their men came up against the inhabitance of Gibeon, who were allies of Israel. As it happened, the men of Gideon sent word to Joshua for help; and Joshua, being greatly encouraged by the Lord, came to their aid. And God caused the Amorites to flee in fear. Now here is the miraculous part: as Joshua and his men were pursuing them, knowing that they needed more day light hours than the day could offer, Joshua prayed for the sun to stand still! Thus the sun stood still, and the moon stopped, until the nation avenged themselves of their enemies. What a day that was! Because of Joshua’s prayer God caused the sun to stop in the middle of the sky for a whole day (v. 13)! If you think some people are going too far for praying for rain I wonder what Joshua’s men thought of this prayer? “He’s praying for what?” Then I wonder what they said when the sun and moon stopped? We must conclude that this is one of the greatest faith-filled prayers ever made, and also one of the greatest answers given. 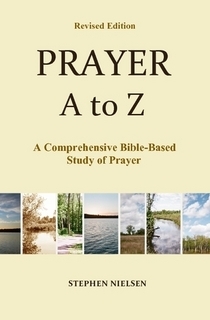 This entry was posted in Part 2, Joshua to Samuel, Prayer A to Z Excerpts, Survey of Prayer and tagged miracles, prayer. Bookmark the permalink. This reminds me of a story written in Streams in the Desert. Thanks for sharing, Stephen … I am also reminded of 2 Corinthians 3:5 …He is sufficient … not we! Thanks for sharing about George Muller. I have read a small biography of his but don’t remember that story. But as I said it was a small book. Being a painter I have often prayed for it not to rain, but in those times I also prayed, “may your will be done,” because to get a house painted isn’t really that important, and God may have other plans.